High security Card Printer, the CORE8 from Evolis card printers. Unique card printer with both direct colour graphics and permanent laser engraving. High performance printer for affordable secure card printing, minimize service requirements with a robust card printer for decentralized card issuance. CORE is a card printing system designed to meet demand for ISO 7810 plastic card personalization, allowing the pritning of secure credentials through direct colour printing of a picture in combination of laser engraving for text and ghost image, an asserted feature that makes it virtually impossible to counterfeit the card. An integrated laminator module provides in a single step to the definitive protection of the card. Several available options make the CORE system ideal for instant issuing of qualified documents as well as banking cards with ISO magnetic stripe and EMV encoding. 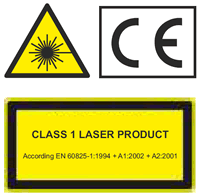 Diode Pumped Solid State laser source. Card types: PC cards with varnish Unichroma, PVC cards, PET cards, ABS cards, Recycled PET cards. Card format: ISO CR80 - ISO 7810 (53.98 mm x 85.60 mm). Output connection: single Ethernet LAN, option USB for chip encoding. Complete software suite tools for users and developers. Footprint: 94 X 28 X 48 cm. Total weight: 30Kg Temperature: 18-30° C Humidity 20 – 65% non condensing. Power Supply: 100 – 240 V AC 50-60 Hz 350 VA.